Fact or fiction: Is mascara bad for your lashes? My mom told me that mascara has harmful effects on eyelashes. She said that a study was done showing that mascara thins lashes and eventually makes them fall out. Is this true? Some mascaras use petroleum-based formulas. Avoid these, as they can cause allergic reactions and slow the growth of hair follicles along your eyelid. An all-natural mascara will be gentler on your eyes and lashes, but they’re also more expensive. If you do decide to purchase a more traditional brand, look for a hypoallergenic label as well as formulas that boast moisturizers or lash conditioners. 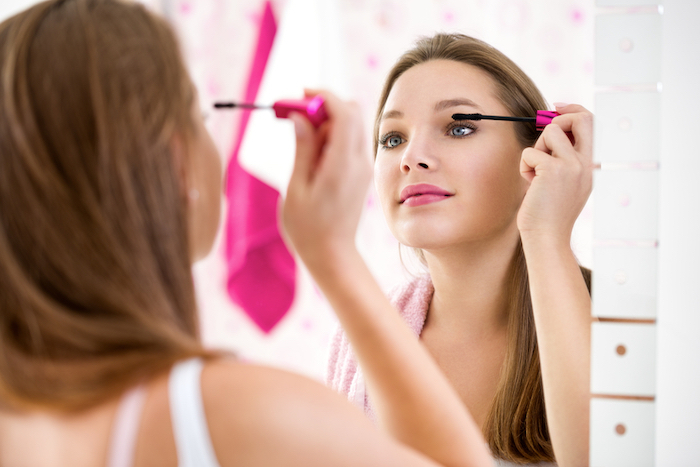 Waterproof mascara is difficult to remove, so buy and use it only when absolutely necessary. It’s tempting to pump the mascara applicator in the tube to really coat that sucker with lash-enhancing goop, but resist the urge. Pumping the brush forces air inside the tube, which helps bacteria multiply. And do your eyes and favor and toss your mascara every four months, OK? One more thing: Lots of makeup artists suggest piling on multiple coats of mascara. While that’s fine for a special event, applying bunches of mascara on an everyday basis makes it more difficult to remove at the end of the day and causes breakages, making your gorge lashes short and sparse. You’ve got to be gentle when you’re removing your eye makeup. Soak a cotton pad or ball with makeup remover and careful rub your lashes. Being quick and rough will make your eyelashes fall out in seriously unattractive patches, and going to be with mascara on? Bad idea, babe. It’ll weaken the hair and cause breakages, and bits of flaking mascara can fall into your eye and mess up your vision. Not cool.